Our luxurious all suite ship will take you in style on voyages of breathtaking beauty and discovery on the mysterious rivers of Myanmar (Burma). Visit temples, pagodas, palaces and monasteries along the Irrawaddy River. The cruise may be fantastic on its own or as an add-on for your holiday. This tour starts in Mandalay and ends in Bagan or vice versa, however transfers from other locations can be arranged as required. Discuss options with our Asia Travel Experts. Check in at 12:30pm and settle into your suite. If you arrive on an earlier flight we can arrange a tour of Mandalay. This will include a visit to Mahamuni Pagoda, Shwenandaw Monastery and lastly a visit to Kuthodaw Pagoda (Maha Lawka Marazein). Kuthodaw is often called the biggest book in the world, for surrounding it are 729 marble slabs inscribed with the Tripitaka texts (Buddhist cannon). Lunch will be served on board as we cruise towards the pagoda sprinkled hills of Sagaing. In the afternoon visit the pagoda sprinkled Sagaing Hill, an important religious and monastic centre, home to some 554 monasteries and 6,000 monks and nuns. Here we will visit a Monastic school and orphanage where you will have the opportunity to meet some of the residents and understand the teachings of Buddhism. Next, take in the views from the top of the hill on the terraces of the Soon U Ponya Shin Pagoda which are truly breathtaking. Below and all around, pagodas of different shapes and sizes dot the landscape. Amarapura, was once known as ‘The City of Immortals’. Today, the leisurely ‘clack-clack’ from the looms of the cotton and silk weavers has replaced the noisy bustle of this former capital. Visit the U Bein Bridge, a spectacular place to enjoy the sunset. This long teak bridge snakes across the Taungthaman Lake. After sunset, return to the Sanctuary Ananda. Today is spent sailing south towards Salingyi. Take the opportunity to enjoy the on board activities and amenities. After breakfast, our Executive Chef will take you on a culinary journey through the unique favours of Myanmar with a cooking demonstration. This is a great opportunity to discover what spices, meats and vegetables are used in traditional Burmese cooking, giving you lots of recipe inspiration you can take home with you. After lunch a variety of on board activities will be offered including a back of house tour, a longyi (sarong) and thanaka (cosmetic) demonstration and a talk on Myanmar – covering the country’s incredibly rich history, the recent controversial decades to the outlook for the future of The Golden Land. As we continue to sail south, enjoy the scenery of Myanmar’s river from Sanctuary Ananda’s sundeck. The inviting sun-loungers are shaded by canopies for when the sun is too high, while the plunge pool provides a cooling experience. There is also the option to visit our in-ship spa by L’Occitane where there is a wide selection of treatments to choose from. Try therapies such as a traditional Thai massage or reflexology session. Our signature treatments include the ‘Ananda body scrub’ and ‘Ananda facial’, all using L’Occitane products and guaranteed to leave you feeling rejuvenated and ready for everything Myanmar has to offer. Just before sunset we will enter the Chindwin River and start sailing upstream towards Monywa. This is an altogether different river to the Irrawaddy so expect the scenery to change dramatically and beautifully. A delicious dinner will bring the day to an end. This morning, visit the Po Win Taung caves near Shwe Ba Taung. Carved out of the sandstone hills, this setting is breathtakingly special to behold, and a highlight of any trip to Myanmar. More ancient than the Thanbodday pagoda are the two cave pagoda complexes of Po win taung and Shwe ba taung, believed to be over 300 years old. There are almost one thousand caves in which both the Buddha images and the thrones were carved out of living rock. The natural shape of the caves was kept, and 17th century wall paintings in exquisite detail cover the interior walls. The entrances are rimmed with traditional motifs of vines and flowers, in high or low relief. Figures of mythical beings and traditional design elements are seen both carved and painted. After the morning’s exciting excursion, we’ve chosen the perfect spot to serve a gourmet picnic lunch, offering exceptional views of the surrounding scenery. Next we’ll head on to the intricately decorated golden Thanboddhay Pagoda, a truly staggering sight with its hundreds of crumbling stupas and almost half a million images of Buddha located in the niches around the inner wall. Afterward, visit Bodhi Tataung where you can see the two enormous Buddha statues – the one reclining is about 333 foot long, and the other stands at a record height of 424 feet. The reason we bring you here at this time of day is that it is best appreciated in the afternoon light. Back on board, enjoy a delicious dinner and cocktails on board. After breakfast, join one of our chefs who will take you to the local market in Pakokku where mouthwatering fruit and vegetables are laid out with consummate style. We will return to the Sanctuary Ananda for lunch as we sail on to Bagan. After lunch on board, we will visit a small pagoda complex to see the different architecture of the stupas first-hand. Next, on to the great golden Shwezigon Pagoda. This holds a special place among Burmese pagodas for two reasons: it was the first major monument built in the Burmese style (as distinct from Mon style) following the country’s conversion to Theravada Buddhism, and was the first pagoda to have nat (spirit) images allowed within the precinct. The Shwezigon is said to contain important relics of the Gautama Buddha, two bones and a copy of a tooth. Enjoy the sunset over the Bagan plains. Admire the light change on the pagodas as they exude antiquity and mystery. Enjoy an early breakfast on your final morning before check out at 9am. If you are departing on a later flight we will arrange for you to take a tour in Bagan. Leaving at 9am we will visit a local village in the heart of the Bagan plain, to see the way of life of the local people. Next visit a lacquerware workshop. This ancient craft has been produced in Bagan since the time of King Anawrahta around 1050 AD. Here in the workshop the traditional methods are still used. Sanctuary Ananda is custom built by local craftsmen using traditional materials while offering sleek contemporary luxury. 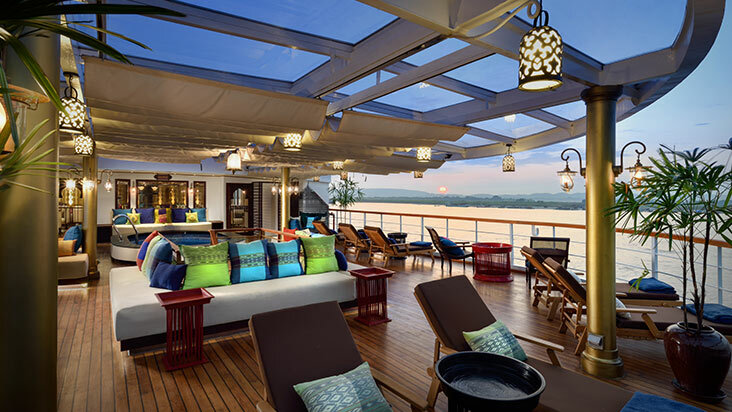 Sanctuary Ananda set sail on the Myanmar Rivers in November 2014 and offers 20 spacious suites on three decks, the luxurious Owner's suite, a sundeck with an outdoor pool and the Kansi panorama lounge. 4 nights aboard your Cruise Ship. Rates include all meals, soft drinks and local beer during the day, local wine with lunch and dinner, guided excursions, and all port charges. Prices exclude international and internal flights, transfers, wine (outside of meals), spirits and gratuities.